Moscow, August 21, Interfax - Moscow's Tagansky Court will hear on Tuesday a complaint by gay parade organizers against an official ban, imposed on the May 27 gay parade in downtown Moscow. The court adjourned the hearings from July 19 at the request of the city's Central Administrative District officials, who said they were busily involved in another litigation matter, although the claimants had insisted on hearings in the defendants' absence. The organizers of the gay parade, who "applied for an official permit to hold a picket on Moscow's Lubyanskaya Square on May 27 in support of tolerance towards the gay community in Russia and the observance of their rights," were denied permission to stage their action. The district prefecture argued that, "the picket could spark public resentment, given the requests to ban this public event, laid down in numerous letters from government and parliamentary officials, religious confessions and individual citizens." The prefecture also expressed fear that the picket might provoke "a wave of protests leading to massive disturbances and breaches of the peace." The freedom of association, set forth in the European Convention on Human Rights, could be restricted to safeguard public peace and to prevent unrest, Moscow officials said. Dmitry Bartenev, a claimant, said that the district prefecture's decision was illegal. "The prefecture motivated its decision by the letters conveying a negative attitude to the event and by the fact that it was incapable of guaranteeing security to its participants in a city where events involving thousands are held daily. This one would have been attended by not more than several dozen people," Bartenev told Interfax. The event was the first public action of the Russian gay and lesbian community after the May 27th banned gay pride. “We applied for this picket a week in advance and the next day, we received a positive answer from the local authorities” said Nikolai Baev, an activist from Project GayRussia. Asked how he explains this change of attitude from the Moscow authorities --a City Hall official declared last May that Moscow government will always forbid any demonstration supporting homosexuality-- Baev explains the strategy followed by his group "We did not tell them that it will be connected with LGBT rights". Ultimately, the authorities allowed the picket because they did not really know the topic. A similar strategy could not be used for a gay pride. Interestingly, the "concurrent" portal Gay.Ru didn't report on this demonstration, but instead published an article preaching the successes of the gay amusement industry in St. Petersburg, with a poisonous remark that "irresponsible provocations from gay activists from Moscow" are to be blamed for gay pogroms preceding the gay pride on 27. May 2006. I would say, this article uncovers at least the riddle with "shadowy bar owners" who resisted the gay pride initiative. P.S. My comments on Gay.Ru were consequently deleted (twice) so it must be assumed that the people working there are attempting to ban any notice of Mr. Alexejev and his political actions from their forum. This has nothing to do anymore with gay activism, that's pure commerce at gay people's expenses. Unfortunately, I do not think "politics" is quite what Mr. Ireland is suggesting. I think the proper word might be "krysha." Certainly, the "Gay Pride" (we call it here a "Christopher Street Day") is not the most important thing in our life, but it is of course better when this particular event is controled by a "roof" committee from local activists, instead of mafia. However, I have the impression that cooperation with bar owners is necessary for any kind of successfull show event, which the prides are now at most places. For a political demonstration, one hardly needs much money. Actually, I am not sure that financial fears from "shady bar owners" were decisive for the campaign against Mr Aleksejev - I would rather suspect that personal vanity among the self-appointed "gay national leaders" has played the main role. It also seems that Mr Aleksejev did not entertain sufficient efforts to win the others for his idea - which, of course, in no way justifies the highly irrational and destructive campaign against him. But we shall not forget that any movement goes through similar childish phases in beginning - it remains the task of the near future to clarify positions and learn to fight against the enemy, not against each other. Olga Suvorova, lesbian activist from lesbi.ru. These four persons actively agitated against the Parade planned by Mr Alexejev, namely by issuing two manifestos (with various other semi-activists) and made everything possible to discreditate the idea of the parade and its initiator. In the 10 - 11 monthes preceeding the parade, numerous critical to vicious articles were published both on gayclub.ru and on gay.ru, mentioning that Mr Alexejev was receiving "grants" from mysterious western sources and sugesting he were a paid provocator. These personal insults did not remain unanswered, as Mr Alexejes's own portal Gayrussia.ru has published several severe statements on the assumed enemies in turn. Step by step, the confrontation escalated so much that the critics were apparently not permitted to the press-conferences of Mr Alexejev etc., so I suppose that the contrahents do not speak to each other anymore. The few commercial activities are controlled, as far as I can judge, primarily by Ed Mishin (print magazine + a shop for books, videos, lubricants) and few other individuals who are, of course, not interested in excessive PR. At least some of them must have good connections to the police, because the only one time when the popular and overpriced club "3 monkeys" was picketed by homophobes, the protesters were quickly collected by the riot police, a luck uncommon in Moscow for gay business. By the way, "3 monkeys" was the club which cancelled the party of MR Alexejev's festival just 2 h before opening - a perfect sabotage. From all the actors, only Olga Suvorova appears suitable for any constructive activities in the future - onlike others, she did not participate in the smear rumors about the "grants" but restricted herself on criticism based on different analysis of necessary activities. She is apparently also the integrative person behind the recent attempt to achieve a unification of russian LGBT activists. Another integrative person might be Vladimir Averin, but he belongs rather to the pro-parade faction so I don't know whether he will be invited by Ms Suvorova to join the unification efforts. Ed Mishin seems to restict himself to commercial activities nowadays; whereas Ruslan Zujew and his staff (gayclub.ru) show a remarkable degree of profanity and unprofessionalism so far, so it is doubtfull they can be regarded as serios political acters in the near future. We shall hope that more russian gays will decide to get involved in LGBT politics and push the agenda forwards. Doug Ireland has defended Moscow Pride against false accusations with some serious accusations of his own. Moscow Pride 2006 has just published the complete budget for its operations -- showing how it spent its money and where it came from. Nicolas Alexeyev and the Russian organizers of the events took out personal loans to help finance Moscow Pride, despite which it was forced to run up a substantial deficit of nearly 28,000 Euros. Publishing their budget and their sources of financing is a remarkable example of responsible organizational transparency (would that our U.S. gay organizations were as open about their spending.) This was a necessary step, since some gay bar owners with sinister motives have slanderously accused Moscow Pride organizers of pocketing some of the monies. The degree to which organized crime fed off the US gay community (especially in New York) like a tapeworm is not much remembered. So many of those who witnessed those times are dead. Still, it is not a good memory. Moscow Pride's accounts are here. Mr. Ireland speaks of "shady bar owners," yet the story on gayrussia appears to quote specific accusations. Just who is making these claims about Mr. Alexeyev? A sociological survey performed by the Public Opinion Foundation has revealed some additonal statistics about views on homosexuals in Russia. Q: Do you personally know any homosexuals (gays or lesbians)? A: 87% "No"; 11% "Yes"; 2% "Can't answer". Q: How do you personally judge about homosexuals - with condemnation or without? A: 47% "with condemnation"; 40% "without condemnation"; 13% "Can't answer". Q: What do you think, in case someone is a homosexual, shall he hide this fact from public knowledge? A: 53% "Shall hide this"; 28% "Shall not hide this", 19% "Can't answer". Q: Recently the administration of Moscau has forbidden the performing of a "Gay Parade" in the city. Do you think the administration did right by doing so? A: 77% "Yes"; 9% "No"; 14% "Can't answer". From those who personally know homosexual people, only 28% see them "with condemnation", while 63% without. Compared with the general percentage, the most effective way to fight homophobia seems to get out to each and everyone. Unfortunately, this can have deadly consequences: 24% of respondents have severely condemned homosexuality ("amoral", "sin", "adultery", "dirt", "mental sickness" etc. ), further 7% think that homosexuals should be killed. 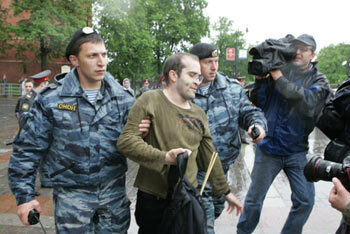 Human Rights Watch has published a briefing paper about the events in Moscow on 27 May. It is also available as a PDF file. Interestigly, on the same day (27.05.2006) when the planned Gay Pride in Moscow was disrupted and led to riots, apparently a kind of gay pride was successfully performed in the city of St Petersburg. On 27th of May, the day of founding of Saint-Petersburg, the provocative show had taken place on the square next to the St. Catherine of Alexandria Cathedral. The content of that show, never publicized before, warrant us to bring attention to this outrageous fact. The obscene dances and vulgar performances with participation of the scantly dressed woman and transvestites were given during the whole evening on the stage, erected with no knowledge of St. Catherine parish’s administration. It was offending not only the feelings of the parishioners who attended the services, but also all decent citizens who came to celebrate the festivities with kids. The soundtracks loudly played made it impossible to perform the evening service, while a group of drunken spectators blocked the access to the main entrance of the Cathedral. The members of the police department looked indifferently on the disorder of the mob that had thrown aside all restrains, while the church’s premises were left unguarded. Lucking any self-control, the audience of so called “The Parade of Love” organized by popular among gays “Central Station” club loudly bursted into the Cathedral, drank alcoholic beverages and urinated at the church’s main and side entrances. The sacred place was desecrated. We think that those who organized this disgusting show and those who had given a permit to organize the show in this place are responsible for all offences taken by the people, whose moral and religious feelings were defiled." The portal GayRussia.ru reports the results of a recent survey on homophobia in Russian Federation (performed by Levada center). Compared with the year 2005, certain decrease of homophobia can be recorded, nevertheless gays face little understanding. Question: "Do you think that consensual homosexual acts between adult person shall be persecuted as crime in Russia?" Answers 2005: 43.5 % "Yes" 37.9 % "No" 18.6 % "can't answer"
Answers 2006: 37.4 % "Yes" 45.3 % "No" 17.2 % "can't answer"
Question: "Russian Law prohibits discrimination on grounds of nationality, race, religion; alike instigation of hate on same grounds. Do you think that the Law shall prohibit discrimination on grounds of sexual orientation?" Answers 2005: 42.8 % "Yes" 36.1 % "No" 21.1 % "can't answer"
Answers 2006: 45.3 % "Yes" 29.2 % "No" 25.5 % "can't answer"
In 2005, 14.3 % supported the idea of gay mariage, while 73.4 % opposed it (in comparison, in the Netherlands gay marriage was supported by 80% of respondents). He said ‘even if 99% of the Russians are against gay parades, it does not matter at all, as there is a minority whose rights are to be respected just as the rights of the rest’. Certainly - "after the parade is before the parade", but gays in Russia should use the year for establishing a national organization. Or how comes that with natural abundance of homosexuals making 7-10% of the entire population, "99% of the Russians" are against gay parades? There is still much to do among gays, in first line. Moscow, May 30, Interfax - Sexual minorities plan to hold another gay rally in Moscow next year and to make it an annual event in the future, Nikolay Alexeyev, leader of the GayRussia.Ru project told Interfax on Tuesday. ‘The 27th of May has been for us so far an anniversary of the decriminalization of homosexuality in 1993 in Russia. But the gay parade in 2006 in Moscow and the situation in which it was held has given much more weight to this date’, the agency’s interlocutor said. Thus he said people of non-traditional sexual orientation plan ‘to raise rainbow flags over Moscow again’ on May 27, 2007, as symbols of gay community. The next year Alexeyev reported will be used by Russian gays and lesbians to challenge in courts of various instances up to the Strasbourg one the ban imposed on the ‘queer march’ in Moscow. To this end, they intend to hire lawyers from abroad, including the well-known London-based gay Professor Robert Wintmute who is said to succeed in a great deal of cases on behalf of sexual minorities. My personal impression is that the mainstream media is somewhat perplex about the courageousness of gay and lesbian participants of the parade, and there is some respect to be read between the lines. Obviously, till the last day they did not believe that those coward "homosexualists" will have guts to actually try and seek direct confrontation with authorities. This was the real succes of the exercise - to gain respect, be it at least for the courage - in Russia, weaklings have poor start. So far,heterosexuals had had with us the option of force without risk.They didn`t like us,and at the same time they did not fear us.Not to be liked we can afford,but then we cannot afford not to be feared.I have no real idea of what amount of fear we could inspire without having an independent State of our own.Perhaps a well developped separatist gay movement could do that.Once we will be feared,will we be safe ? Our situation will be better,but it will never be perfect.In an imperfect world,that cannot be.Once heterosexuals won`t have the option of force without risk against us,they might seek to exploit some temporary political inexperience they may observe or suspect among us.We will have therefore to play their diplomatic games,imitating all the tricks involved,behaving already as a State even if we are still only a political movement aiming at the establishment of a State. One day after the street battles in Moscau, the happening have found wide press coverage in the Western mainstream press. In Germany, the media concentrated their attention mostly on the fact that the German MP Volker Beck from the "Green party" was injured by fashists and detained by the police. Reportedly, German and French "Greens" have urged their respective governments to submit notes of protest to the Russian government. In Russian media the reactions ranged from supportive (see the article below) to abusive (as in Russian television). Most online media restricted themeselve to sober reports, nevertheless the impact was overwhelming - e.g. the leading news portal Lenta.Ru has published more than 10 articles in the last few days. My personal impression is that the mainstream media is somewhat perplex about the courageousness of gay and lesbian participants of the parade, and there is some respect to be read between the lines. Obviously, till the last day they did not believe that those coward "homosexualists" will have guts to actually try and seek direct confrontation with authorities. This was the real succes of the exercise - to gain respect, be it at least for the courage - in Russia, weaklings have poor start. Unlike many Russian "homophiles", the fashists and orthodox christians were not afraid of getting bruised - this collection of photographs shows that they brought even children and old grandmothers with them. As a good sign one can perceive the changed tone in those "homophile" media who opposed the parade for being a "provocation" - now they have joined into the general tone of condemning the Moscau city government and the police. Though one might be tempted to ask: "Where have you been when your brothers and sisters needed you the most? ", gays in Russia shall overcome the past and forget the previous division, for the future will require consolidated actions from all of the activists there. The organization of the parade might have had some weak points, but regarding the general circumstances it was a heroic act - and as such will be written into history books. If you like to read some original reports, try to translate the following articles with Babelfish: 1, 2, 3, 4, 5, 6, 7. Gay-Parade in Moscow was actually doomed to that in order to pass by that not noticed. The matter occurs in the country, where the native citizen, after moving from the province to the capital of its own country, becomes more rightless than an illegal immigrant in Europe, where an attempt to draw attention to the problem of family violence sounds with westernizing exotic character, and where the call for equal wage for the women appears definetely strange, where the torture in the police is routine. Yes, the organizers of parade shall forgive me, but against this background the statement that the inhabitants of the country disrespectfully relate to the sexual minorities, do not shake imagination. Demonstrators would have marched through Moscow, and tomorrow everything about them would be forgotten. But authorities did everything so that oecumenical disgrace would take place instead of the exotic, but completely inoffensive procession in Moscow. First authorities forbade the demonstration on grounds that they had received numerous requests to disallow and to forbid the demonstration, and therefore the authorities feared mass disorders. The simple thought was not pronounced about the fact that exactly for preventing the disorders in the city there is a police, but law-abiding citizens at the demonstration must not suffer from the presence of potential hooligans on the street. Next, orthodox fundamentalists and other radicals went towards the activists, who regarded the prohibition being illegal and decided to go out to the streets. In principle, there is no misfortune in counter-demonstrations of this type. That is the normal life of the civic community: among other minorities in it there is also a group of people, which assume the regime of the functioning of foreign private parts as being in the sphere of their interests. In America, such picketing of abortion clinics, they be going by crowd to shout filth to the frightened and detuned women, who proceed with operation. But people, which come to protect patients from the insults, are instructed as follows: go next to the woman, try to shield her, but on no account do touch participants of the picket with hands; as if you touch them - this already constitutes violence, and it is possible that police will be involved, and there they will not investigate, who held meetings for which agenda. Their matter is to maintain the order. Anti-abortion activists also know this. So everything goes the usual way - some howl, some cover others, and no one touches each other. For this, there is the police. The task of the normal “forces of order” is to tie into the rag its political preferences and to make thir direct job properly, this is to ensure order and rights of citizens. To divide demonstration and counter-demonstration, to tie, if possibly without mutilations, the hooligans, who aggressively attacked participants in the parade, and, most importantly, to ensure that all the others - yes, yes, the fundamentalists and the homosexuals – have the possibility to peacefully express their opinion. Thereafter it is possible to file a lawsuit against the organizers of the unsolved demonstrations from both sides. The Moscow police managed to allow attacks on participants in the march, and - for purposes of "safety" – to lambaste the ones and the others itselfe. This does not mean that in Russia the state is especially homophobic, neither it is anti-orthodox or totalitarian. This somply means that in Russia there is no state in its basic role – the state as organization, which gives its citizens order, safety and possibility to peacefully defend their rights and to express their views. " Some videos can be watched on our "Prometheus".